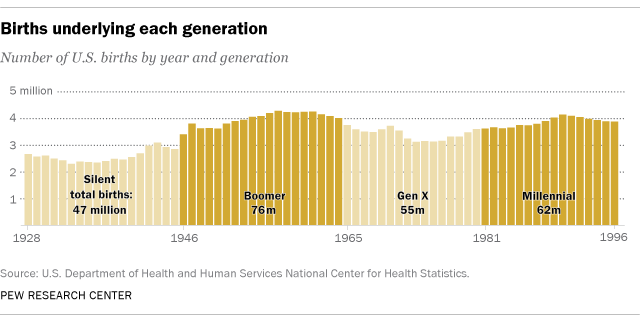 The youngest baby boomers are around 55 years old. The oldest are in their 70s. Most Americans don’t remember a workforce without the largest generation. And yet, as boomers enter their final years in the workforce, their retirements are taking companies by surprise. The survey included 143 human resources managers at companies that, together, employ about 2.9 million people. It was analyzed in a working paper circulated in February by the National Bureau of Economic Research. Managers were asked to compare the business challenges of employee retirements over the past five years with the next five years. In each category, companies saw a greater challenge in the years to come. The respondents were not part of a random sample, and their experiences cannot be considered representative. But they suggest broad concern in the business world about dealing (or not dealing) with an aging workforce. This data was not available otherwise. Record-breaking shares of Americans plan to work longer. An April 2018 Gallup poll showed 41 percent expect to be working beyond age 65 — a huge jump since Gallup started tracking in 1995, when it averaged 13.5 percent. The age required for full Social Security benefits has also risen. Americans born before 1937 became eligible for full Social Security benefits at age 65. For the oldest boomers, born in 1946, the standard retirement age rose to 66. Boomers and others born after 1960 won’t get full benefits until 67. Workers aren’t always transparent with their employers about their plans, said Alan Glickstein, a managing director at Willis Towers Watson who helped oversee the survey. “There’s some pretty significant disconnects, gaps in knowledge between what the employers think and what the employees think,” Glickstein said. They may not know themselves. Even if they do, they may be reticent to discuss their financial situation or make themselves vulnerable to replacement by committing to a retirement date with their employer. In 2017, The Washington Post’s Mary Jordan and Kevin Sullivan reported on the lives of people who had been forced to keep working well beyond typical retirement age, often into their 70s. As more workers become consultants or accept temporary contracts or gigs, their relationship with employers is changing. Boomers’ ties with their employers may be more tenuous from the start. In the end, their bonds are more likely to unravel piecemeal than to sever all at once in a nice ceremony involving a gold watch. “You kind of wonder what retirement is anymore,” Glickstein said. There’s no longer “a magic moment when you stop working entirely,” he added. The share of companies offering older workers partial-year employment and shorter hours is expected to rise sharply. About 2 in 5 companies surveyed are considering offering part-time work or flexible hours by 2020, nearly double the current rate. Others hope to keep older workers around with reduced responsibilities, and a small but growing minority is offering options that blend volunteer work with traditional employment. Four out of 5 manufacturers, and 2 out of 3 employers in the mining and nonprofit sectors included in the survey, were concerned about loss of talent. Retail and service-sector employers were not as concerned. That tends to track somewhat with each sector’s reliance on older workers, but individual industries within each sector vary considerably. Funeral homes, religious organizations, bus drivers, florists and real estate agents all have more than a third of their workers over age 55, according to our analysis of the Census Bureau’s American Community Survey. At the other end are industries that tend to rely on a younger workforce, such as retail, restaurants, electronics stores, theaters and warehouses. In those fields, fewer than 1 in 7 workers are nearing retirement. In many industries, employers also face significant uncertainty as to whom or what will replace a retiring boomer, Glickstein said. As technology progresses, it’s feasible that a robot or computer program could take on some of a workers’ responsibilities when they are ready to retire. That means employers’ succession strategies will evolve alongside technology. And because boomers are the first generation to face the task of passing on their knowledge to machines and computer programs — as well as to apprentices and junior employees — setbacks and tensions are bound to arise. “How do you translate that business knowledge into an algorithm?” Glickstein asked. Scott Clement contributed to this report. The headline has been updated.